Supernovas — the violent endings of the brief yet brilliant lives of massive stars — are among the most cataclysmic events in the cosmos. Though supernovas mark the death of stars, they also trigger the birth of new elements and the formation of new molecules. Over the next 30 years, observations of the remnant of that explosion revealed never-before-seen details about the death of stars and how atoms created in those stars — like carbon, oxygen, and nitrogen — spill out into space and combine to form new molecules and dust. These microscopic particles may eventually find their way into future generations of stars and planets. Recently, astronomers used the Atacama Large Millimeter/submillimeter Array (ALMA) to probe the heart of this supernova, named SN 1987A. 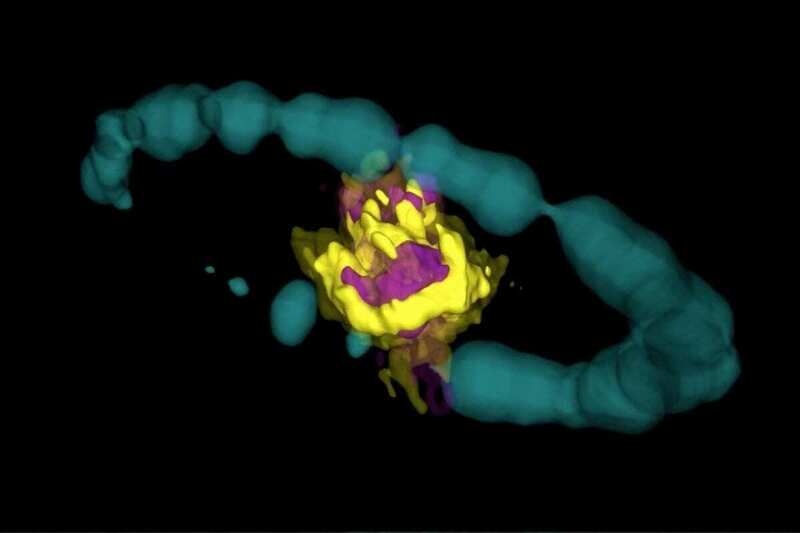 ALMA’s ability to see remarkably fine details allowed the researchers to produce an intricate 3-D rendering of newly formed molecules inside the supernova remnant. These results are published in the Astrophysical Journal Letters. Throughout the observable universe, supernovas are quite common, but since they appear – on average – about once every 50 years in a galaxy the size of the Milky Way, astronomers have precious few opportunities to study one from its first detonation to the point where it cools enough to form new molecules. Though SN 1987A is not in our home galaxy, it is still close enough for ALMA and other telescopes to study in fine detail. For decades, radio, optical, and even X-ray observatories have studied SN 1987A, but obscuring dust in the remnant made it difficult to analyze the supernova’s innermost core. ALMA’s ability to observe at millimeter wavelengths – a region of the electromagnetic spectrum between infrared and radio light – make it possible to see through the intervening dust. The researchers were then able to study the abundance and location of newly formed molecules – especially silicon monoxide (SiO) and carbon monoxide (CO), which shine brightly at the short submillimeter wavelengths that ALMA can perceive. “One of our goals was to observe SN 1987A in a blind search for other molecules,” said Indebetouw. “We expected to find carbon monoxide and silicon monoxide, since we had previously detected these molecules.” The astronomers, however, were excited to find the previously undetected molecules formyl cation (HCO+) and sulfur monoxide (SO). “These molecules had never been detected in a young supernova remnant before,” noted Indebetouw. “HCO+ is especially interesting because its formation requires particularly vigorous mixing during the explosion.” Stars forge elements in discrete onion-like layers. As a star goes supernova, these once well-defined bands undergo violent mixing, helping to create the environment necessary for molecule and dust formation. Future ALMA observations at different wavelengths may also help determine what sort of compact object — a pulsar or neutron star — resides at the center of the remnant. The supernova likely created one of these dense stellar objects, but as yet none has been detected.